Promotional Metal Sports Bottles are a must have sporting accessory, Printed Stainless Steel Water Bottles made from Double walled stainless steel for extra strength and are designed to keep your drink cold for hours. Custom Printed Aluminium Water Bottles come in various shapes and sizes ranging from 500ml to 800ml capacity with our choice of our hiking lids with carabiners, Pop top lids and twist action lids to suit your style. Silver Aluminium Water Bottles, Blue Chrome Sports Bottles and black chrome water bottles with your choice of full wrap printing with larger printing areas available your brand will be on everyone’s lips! Our Sports bottles are free from BPA which makes the bottles safer to re use over and over. Promotional Plastic Drink Bottles are a great promo idea for Health and Sports companies as giveaways and for Schools looking to promote fitness and healthy lifestyles. Vivid Promotions has a large range of cost effective water bottles available in various bright and corporate colours to match your business’ logos. Keeping your water bottle lid clean and free from germs has never been so easy with our next generation Sure Shot lids, simply squeeze the bottle to open the valve inside the lid which releases the fluid, No need to ever touch the lid with your mouth. Customized Plastic Water Bottles with frozen cooler tubes inside are ideal to keep your drink cold all day long, fantastic for your child’s school lunch and after school activities, the light weight sports bottles range from 350ml to 750ml has a comfortable grip and is sure to inflate your brand’s potential. 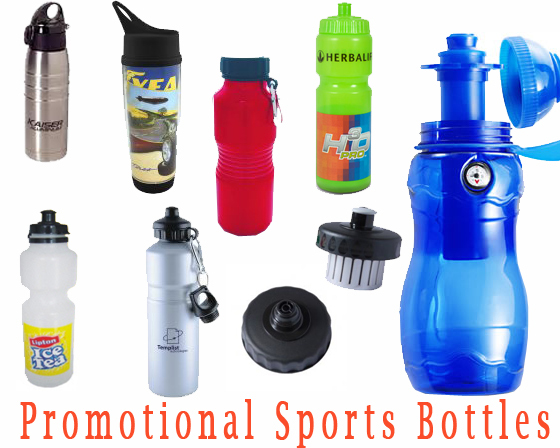 For more info on our Promotional Drink Bottles take a look at our Metal Sports Bottles and Plastic Sports Bottles Categories.